Dzhokhar Tsarnaev shuffled into the courtroom, appearing confident despite the ankle chains and an orange jumpsuit so big on him that it made him appear younger than his 19 years. As federal prosecutors read the charges against him Wednesday in his first appearance since being captured in April, Tsarnaev repeatedly looked over his shoulder at the packed courtroom, at one point blowing a kiss to his sisters, one sobbing and another holding a baby. Tsarnaev, who could receive the death penalty, fidgeted in his seat as he listened to the charges, one of his attorneys patting him on the back gently several times. He had a visible scar just below his throat and had a cast on his left arm. Jennifer Regan of Stoneham — fiancee of Marc Fucarile, who lost a leg in the bombing and remains at Spaulding Rehabilitation Hospital — summed up her feelings at finally seeing the alleged bomber: “He’s disgusting,” she said. Because the case is in federal court, US Attorney General Eric Holder will decide whether Tsarnaev should face the death penalty, which has not been administered in Massachusetts in 66 years. Tsarnaev’s appearance lasted about seven minutes and was under heavy guard. His older brother, Tamerlan, the alleged mastermind of the bombings, died after a confrontation with police in Watertown. For weeks, the John Joseph Moakley US Courthouse has been the venue for one of the biggest criminal trials in the past decade in Boston, the racketeering case against Boston gangster James “Whitey’’ Bulger. On Wednesday, however, most of the attention was on the slight former University of Massachusetts Dartmouth student who had emigrated from Russia. Outside the courthouse, lines of uniformed MIT police officers stood at attention, honoring Sean Collier, the young officer who was allegedly shot to death in his cruiser by Tsarnaev. “I’d like to grab him by the throat,’’ he said. Before the proceeding, about a dozen supporters of Tsarnaev cheered as heavily armed US marshals escorted the defendant’s motorcade to a back door. 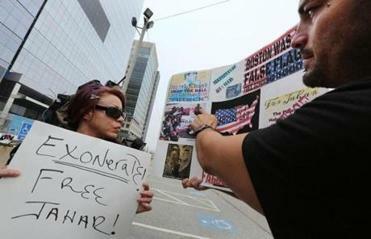 Their shouts enraged a man who was walking past the courthouse. Dzhokhar Tsarnaev entered “not guilty” pleas in a thick accent seven times to charges that include using a weapon of mass destruction. Several members of the high school wrestling team that Tsarnaev captained during his senior year at Cambridge Rindge and Latin School also came to see their old friend. “I was looking to see if I could see any remorse, but I couldn’t tell,” he said. Payack and some wrestlers said Tsarnaev’s “not guilty” answers seemed to reflect a foreign accent, which is not how they recall him speaking. The indictment alleges that before the bombings Tsarnaev downloaded extremist Islamic propaganda from the Internet, including material directing Muslims not to give allegiance to governments that invade Muslim lands and writings by Anwar al-Awlaki, the American citizen who became a senior operative in Al Qaeda’s branch in Yemen and who was killed in a 2011 drone strike. Tsarnaev allegedly wrote a confession in the boat where he hid from authorities until emerging covered in blood in a Watertown backyard. The note reportedly justified the violence because the “US government is killing our innocent civilians” in other countries. The federal charges include malicious destruction of property resulting in death, conspiracy, use of a firearm during a violent crime, and carjacking resulting in serious injury, federal prosecutors said. After the arraignment, Tsarnaev was escorted by deputies from the US Marshals Service back to a locked medical facility for male prisoners at Fort Devens, where he has been detained since being released from Beth Israel Deaconess Medical Center. Dzhokhar Tsarnaev’s relatives left the courthouse shortly after his arraignment. Many of the victims avoided the large presence of news crews swarming around the heavily guarded courthouse. Others said they want to ensure that their pain is not forgotten. Mildred Valverde, 44, of Somerville went to Boylston Street to watch her son’s former teacher run the Marathon and suffered ligament, muscle, and nerve damage, as well as vision loss from the blast. She came out of court using one crutch and wearing an ankle boot. Her 15-year-old son suffered a concussion and emotional distress. She said seeing Tsarnaev, whose dark eyes never gazed back at the side where many victims were seated, didn’t change anything for her. “I want him to rot in jail for the rest of his life and suffer the way he’s made many other people suffer,” she said. 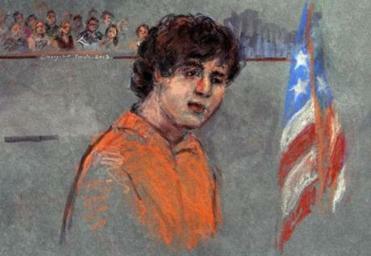 Tsarnaev has a status hearing scheduled for Sept. 23.
globe.com. Follow him on Twitter @globemoskowitz.